"There are some people who are good, some people who want to help"
Bryony Spooner talks to Adjo Aklikoko about the training and support Deki's Local Expert, IADES, provided. 'When a friend of mine recommended me for a micro loan with IADES I said no. Never again', says Adjo Aklikoko, mentioning the unfairness she previously felt with the microfinance loans she had in Lome, the capital of Togo. 'It was impossible. The interest rate for all members of the group got higher if one member did not pay on time, we continually found that the whole group suffered. Money was collected weekly and it worked like a bank. It was hard to pay if you had a bad week'. 'I said no, but my friend pushed me to join her loan group; "there are some people who are good, some people who want to help'. Adjo Aklikoko, 39, is married with three children aged 17, 14 and 9. Her business is a small shop that sells plastics bowls and wigs. With it she supports her immediate family, as well as her siblings. Microfinance is not a new concept, it was started originally by Mohamed Yunus, a Bangladeshi social entrepreneur, banker and economist in the 1970’s. Yunus was awarded the Nobel Peace Prize for his work founding the Grameen Bank and pioneering the concepts of microcredit and microfinance. His loans were given to entrepreneurs too poor to qualify for traditional bank loans. However, as the popularity of Microfinance spread, so did the more unscrupulous MFIs (micro finance institutions). Togo currently has 286 MFIs (in comparison to 12 banks) and only 86 of these are state recognised. Most of these Institutions only give loans to men, as woman are seen as too financially weak. Togo is ranked 168th out of the 188 countries that are the World's worst places for women to live. All donations up to £10,00 will be matched. Donate today to double your impact! IADES, our Togolese field partner, is a rare, but thankfully different story. Their social mission is key part of their work, which looks to reduce gender inequality and improve women’s lives. Over 90% of their loans fund women. The director of IADES, Christian Kadangah explains 'If you give a loan to the man of the house it doesn’t have as much of an impact. Whereas if we aim to empower to the woman she provides for the whole family'. When you take a loan with IADES you must go to fortnightly training. This includes topics such as business and economic training, social, welfare and even health training. 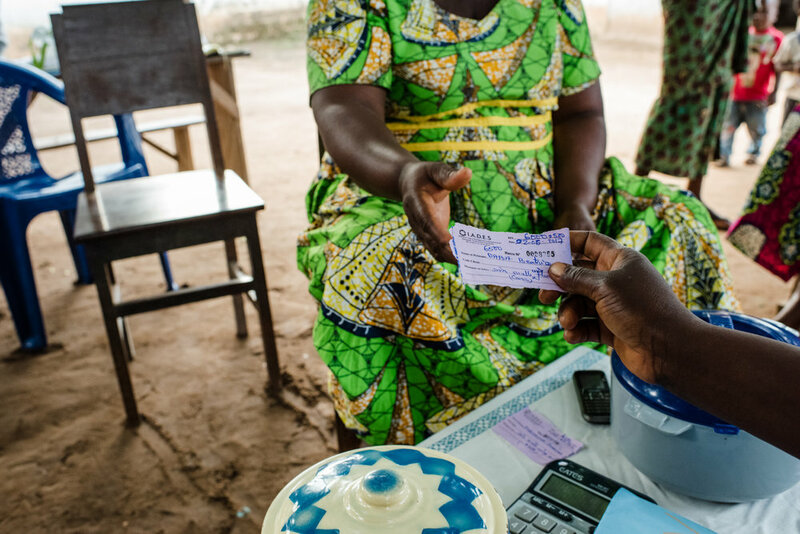 Many of the women who receive loans have never had the opportunity to go to school so they run training sessions with picture cards for those that cannot read. Other members of the community who might be considering applying for a loan are invited to attend too. Before receiving a loan each entrepreneur must sign a ‘Good Practices Charter’ with an IADES loan officer, which is explained to them before signing. It includes the importance of a child attending school, the definition of child labour and benefits saving for the future. Entrepreneurs band together, forming a group. Each group must have a President, a Secretary and a Treasurer to create structure and order. The group work together to repay their loans. Each group has a solidarity fund where they pay an extra 2% in and this is used to support them in case of problems repaying such as sickness. IADES charges interest of approximately 2% per month to cover the cost of delivering the loans and training, which gradually decrease over the reimbursement period. Compared to a high street bank or MFI in Togo which routinely will charge 6 or 7%. IADES charges no interest on loans under £27. Deki charges nothing to deliver the loans. Adjo’s friend was right, within five months of taking the loan Adjo had been elected president of her group and she now advises others in the group. 'It was such an honour to be chosen, I want to be a leader by example. It never occurred to me before that you can work to help others solve problems'. £125 could support our Local Experts to develop social and healthcare workshops that meet the needs of the community. A donation of £125 today, will be doubled! Adjo still works hard, working up to 70 hours a week selling her wigs and plastic bowls. When she requested her £90 loan she used it to invest in more stock. She bought 36 wigs and 20 large plastic bowls. With her next loans she wants to expand into shoes. 'The prices of wigs can vary', Adjo tells me. 'I make the biggest profit from weaving the wigs, which can take several hours. Often ladies request them for special occasions, especially when there are big festivities in the city'. Today is one such day as it is bank holiday in Togo and thousands are heading to the beach for a party. Adjo has stayed behind to talk to me. £70 will support the Deki loan cycle, over 12 months, for one Deki entrepreneur. We work with our Local Experts to ensure that all Deki entrepreneurs are assessed, monitored and evaluated. Your donation of £70 today, will be doubled. Supporting the loan cycle for one Deki entrepreneur for 2 years.